Beaten by a nose in last year’s renewal at Keeneland, Apple Betty left little doubt she was a deserving winner of Sunday’s Grade 3, $125,000 Rood and Riddle Dowager Stakes. The Irish-bred daughter of Galileo stalked the pace and zipped by in the stretch to win Sunday’s feature, finishing 1 1/2 miles on the turf in a final time of 2:30.80. Off at 3-1 for trainer Shug McGaughey, she returned $8 after hitting the wire 3 1/2 lengths in front of Promotional with Lottie, the 5-2 betting favorite, in 3rd. 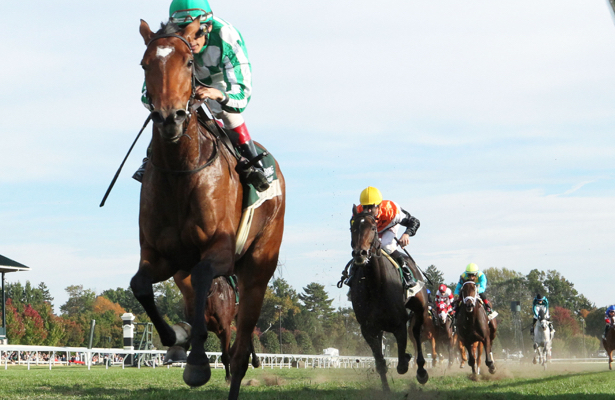 Campaigned by the Absolutelyfabulous Syndicate, Apple Betty broke through in graded stakes company Sunday off a 4th-place effort in Saratoga's Waya Stakes in August -- which followed a win the month prior in a black type stakes at Belmont Park. "When I ran her at Saratoga, I ran her back too quick, and she got pushed along a little bit," McGaughey said. "We gave her the break with this race in mind, and she had trained really strong." The 2016 Dowager marked Apple Betty's first domestic start after beginning her career in France. Jockey John Velazquez was aboard the winner, a 4-year-old who won her 5th race in 14 career starts. "Once I got her through at the quarter pole, she did it pretty easily," Velazquez said. "She was really good in the post parade. I was telling Shug, 'She's ready today.'"